Colleges use their Solardome® geodesic domes for multipurpose activities ranging from a science building or outdoor classroom to elegant display and gallery structure. We have two dome ranges for you to choose from. Our standard SOLARDOME® for growing schools glasshouse range 3.5-10m diameter, and our SOLARDOME® PRO architectural system, for fully habitable dome buildings from 10m-25m – perfect for a stylish reception, cafeteria or studio. 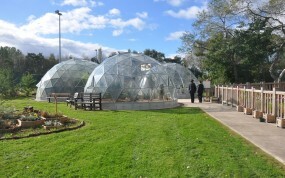 Our unique glasshouses can be used to create a specialist environment away from the main buildings for science and engineering projects, environmental studies, horticulture and technology. The Solardome® geodesic dome is also the ideal structure for studying the work of American inventor, Richard Buckminster Fuller. 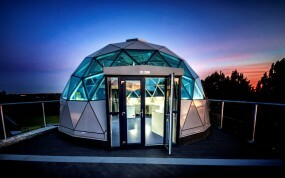 He demonstrated that the geodesic dome is the ultimate way of enclosing space and is the strongest structure available. Bring organic chemistry to life by investigating how the geodesic shape is replicated in nature in the family of carbon molecules called “fullerenes”, after the geodesic dome inventor. Where space is at a premium and you striving to maximize the area you have, a geodesic dome creates a practical and stylish building quickly and effectively with minimal foundations. They provide a unique setting for special occasions, why not use it as a stylish reception area, canteen, music centre or as a display area for college artwork? 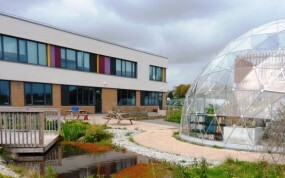 Wellacre Academy’s innovative ‘Ecology Centre’, featuring three Solardome® glasshouses, opened in 2011 and immediately won the prestigious International Green Apple award for the Built Environment. Watford Grammar School for Girls’ wanted to create a new, 21st Century science lab that would “bring science alive” and inspire its students to take on original research projects.